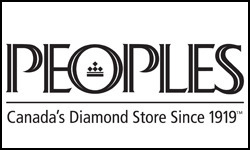 Since 1919, People's Jewellers has delivered the best value and knowledge in their exceptional fine jewellery and diamonds. Today they are recognized as Canada's number one Diamond Store. Whether you are searching for a gift to declare your eternal love or you're looking to treat yourself to a fine new piece of jewellery, you can trust in the expert staff at Peoples to help you make the best possible choice. Your customer satisfaction is always guaranteed. Browse their latest collections of fine earrings, necklaces, rings, bracelets, watches, engagement rings and more. You can even get creative by purchasing your own custom jewellery in store. Discover the People's difference when you shop at Calgary's CF Market Mall.